The incident happened in Keith, Moray, in the early hours of Saturday. 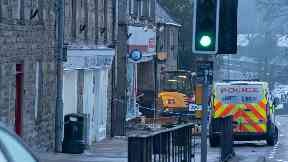 A man has been arrested after a digger was rammed into the front of a convenience store in Moray. 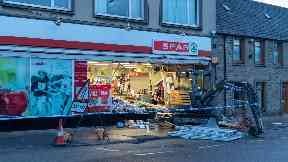 The front of the Spar was completely destroyed in the incident. Police closed the A96 in both directions following the incident in Regent Street, Keith, at around 3.35am on Saturday morning. A spokesperson for Police Scotland confirmed a 35-year-old man has been arrested and enquiries are ongoing. They said: "Police Scotland can confirm that a 35-year-old man has been arrested after an incident where a digger was used to drive into the front of the Spar shop in Keith. "The incident happened about 3.35am at Regent Street in the town. "Significant damage has been caused to the shop and there is debris on the road leading to it being closed for the time being." Diversions have been put in place via Newmill to the north and Drummuir to the south. The police spokesperson added: "Motorists are thanked for their patience during this time. "Enquiries are ongoing into the incident and officers are appealing for anyone who was in the area at the time to contact them on 101."